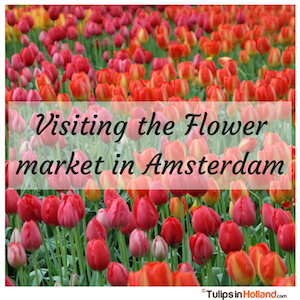 The flower market in Amsterdam is the only floating flower market in he world. The flower shops stand on the houseboats below and it is an interesting place to stroll around. You will find all sorts of seasonal flowers, bulbs, and souvenirs. You can find lots of Tulips, daffodils and hyacinths during springtime. The flowermarket is open Mondays through Saturdays from 9.00-17:30 and on Sunday 11.00-17.30. Great place for seeing lots of flowers and bulbs. You can see tulips during spring season. Don’t buy any bulbs between December and August. These bulbs are from last season and won’t blossom when you are at home (they will be to old, moldy etc). Make sure when you buy your bulbs that they will grow in your garden. Tulip bulbs need a cold period of at least 6 weeks around freezing temperatures. Please be aware of pickpockets on this very busy market. Traveling to the Keukenhof and the tulips in Holland next springtime? Sign up for our weekly newsletter to stay up to date with the last blooming statuses and interesting tulips in Holland information. Sign up here.